I tend to not pay much attention to recipes when I rip them out of magazines (or bookmark them). It’s sort of like, ooooh, that looks good. I’m going to make that! And then realize that I don’t have a food processor or a paella pan or a team of highly-trained professionals to assist me. Case in point. I saw this recipe online and fell in love with the idea of Beef Wellington. 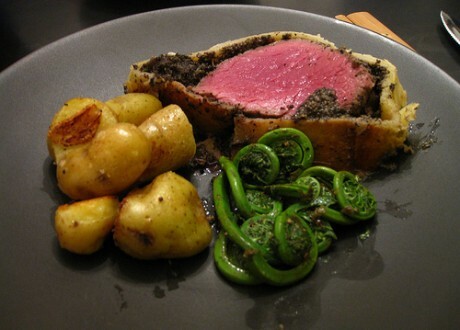 I love classics and reviving traditions in food, but I have never had Beef Wellington, neverless made it. It looked delicious, though, so I announced that it was on the menu for dinner. Then I realized there’s a reason that I’ve never had it before. Beef Wellington is hard. It involves puff pastry for chrissakes. Luckily I have a friend who is adept at pastry, so I put her in charge and we were off. Matt modified the recipe from Gordon Ramsay and replaced the foie gras with proscuitto and mushroom. He also used puff pastry from a box. If I’m going to do traditional things then I’m going to do them properly, so we subbed back in the foie (but kept the mushrooms too) and Susie started rolling out dough at about 2 in the afternoon. Mostly it went well. We used a recipe from one of her baking books, but there’s a good one in the Joy of Cooking as well. Or you can save yourself 6 hours and use the one in the box. 1. Sear the meat really well in a large pan. Make sure it’s brown and well sealed (but not actually cooked) or it will be messy later. Remove and let cool then brush generously with the mustard. Put it in the fridge. 2.Puree the mushrooms to make a duxelle and cook it down in a hot, dry pan with the shallots. Cook a few minutes and when the water has evaporated and the mix is sticking together, remove from the heat and add the parsley. 3. Refrigerate the mushroom mixture until all the components are the same temperature. 4. 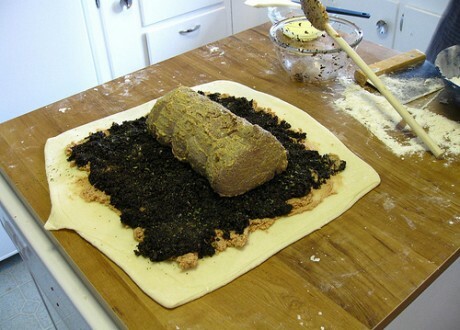 Roll out the dough onto a floured surface, quite thin, making sure that it’s large enough to wrap up the beef. Egg wash the edge of the dough. 5. Spread the foie gras pâté in a thin layer, and then the mushrooms. Put the beef fillet in the middle and roll it up tightly, tucking the ends in. Egg wash the top with the egg yolk and chill approximately 10 minutes. Egg wash again and score the top of the dough. 6. Insert a meat thermometer and roast until the meat is between 120 and 125. Rest 10 minutes before slicing for medium rare. I served it with fresh local fiddleheads and fingerling potatoes in crushed lemon, garlic and citrus salt. Thanks Matt for the inspiration. You are a talented and dedicated food person PLEASE try to refrain from expressions like chrissakes-surely there is some other worthy word you can use to make your point. I’ve been toying with the idea of making Beef Wellington tonight, Dec.31st to ring in the New Year.I’ve also been a little hesitant as I’m not overly found of meat too rare.I’ve purchased the Beef, and cheated and bought the puff pastry ready made. So, I experimented on some salmon, prepared a stuffing of mushrooms, leeks,spinach and ricotta then wrapped this experiment in the pastry and what came out of the oven was a thing of beauty and a delight to eat.So, I know think I’m ready for the real beef deal, good luck to me! This will be an undertaking for tomorrow, not enough time. What a way to start the year! Good luck. Happy New Year. I’m looking for something tasty and elegant for a lovely xmas dinner for two… this looks perfect, thanks! I’ll try the salmon too! sounds like a lovely Christmas! let me know how it goes. I will be trying this recipe on Sunday for eight family members. I love to cook but this will be the first time making beef Wellington. Wish me luck. I wish I had found this before I just threw a beef wellington together based on a vague idea of what it was. beef sirloin + sauteed mushrooms + tarragon butter + store-bought puff pastry. I seared the beef first, but didn’t cook the assembled mess at a hot enough temperature for chrissakes. it was still pretty tasty. I think yours sounds better. Going to make BW for Christmas dinner celebration, have been researching on the ‘net, stumbled on these ideas. There are lots and lots of recipes and hints and tips out there, wish me luck!